PrintScenic® gobos are glass or plastic gobos that projects color photographs or graphics. Designed for use in approved LED fixtures only and in brief or temporary installations. The multi-layer printing process enhances the color saturation to create a “true” opaque black, not “transparent” printer black. Many of our designs are available as a PrintScenic® gobo. However, this is dependent on the pattern’s level of detail and gobo size. 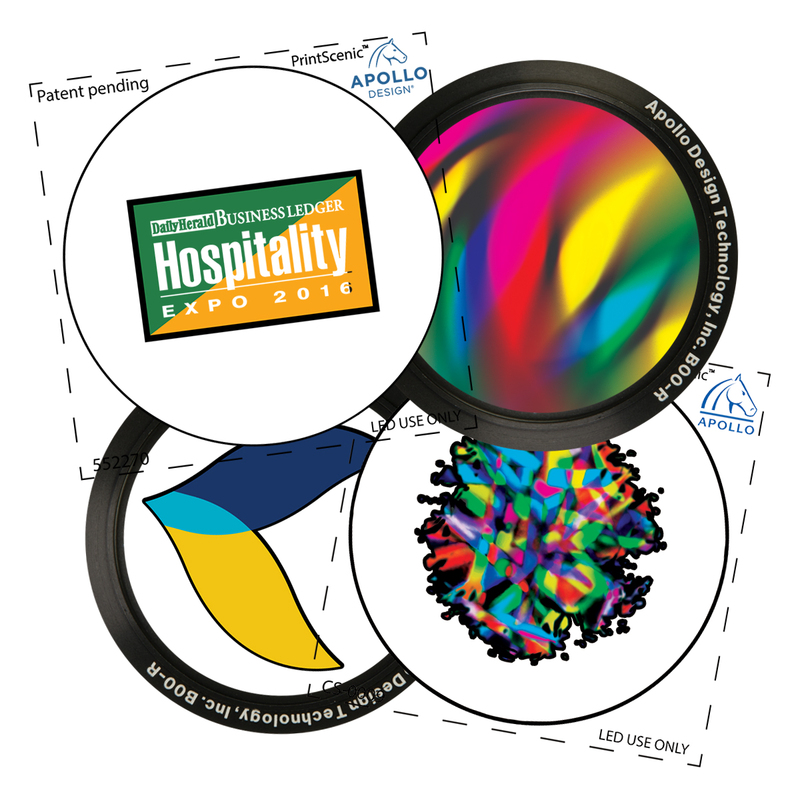 Submit an inquiry using the form below to see if a specific pattern is available as a PrintScenic® gobo. Note: PrintScenic® gobos may “smoke” the first time used; this is normal and will cease after a brief time. Please contact sales@apollodesign.net with questions. Final gobo design and artwork detail may differ from original art file due to gobo size, type, and provided artwork. Can this design be a PrintScenic® gobo? Ask us if a design is available as a PrintScenic®pattern. Select from our standard collections of Metal, SuperResolution®, ColourScenic®, 1-Color, or 2-Color patterns. The links will open in a new window. Copy and paste the gobo SKU/Pattern number to the field below. PrintScenic® gobos created from almost any of our patterns typically ships within 24 hours, depending upon availability. However, we regularly ship sooner than indicated. Offers a flatter focal point throughout the life of the gobo compared to PrintScenic® plastic.